guess where i'm writing from today? San Luis Obsipo! if i'm lucky, by the time I finish this post, I'll still be in SLO and not back in the bay yet. But the point is that I'm roaming downtown SLO tonight by myself. My roommate had a wedding to attend, so I accompanied her on the drive and now have the next five hours to myself. So, I'm sitting at a coffee shop with a cup of Papa New Gineau pour over coffee and an order of house fries, which unfortunately turned out to be a little too soggy for my liking. Disappointing, because coffee shops really need to focus on their french fry frying, right? The reason why this is such a big deal is that I'm so bad at doing things on my own. I'm terrible at getting myself out of the house to explore a new place because I hate doing things by myself. it's hard for me to run even the simplest of errands alone. And so, this also ties into self care, because I'm terrible at that. My mind is like a clock, but not that I'm punctual because I'm terrible at that, too. My mind is constantly running- I'm a dweller and a thinker. And because of that, I don't like being by myself, and I keep busy so my mind doesn't think. And, as a result, I don't take care of the things I need to take care of, including myself. I think this has become so apparent because I throw the expectation for other people to take care of me to those who are close to me, when in reality, I need to take care of me. Much of that should be rooted in the faith I have in Jesus Christ, but alas, I am a sinner. I'm working on it, and I think building up gracefulleats has definitely helped me in the process. Thank you for bearing with me. 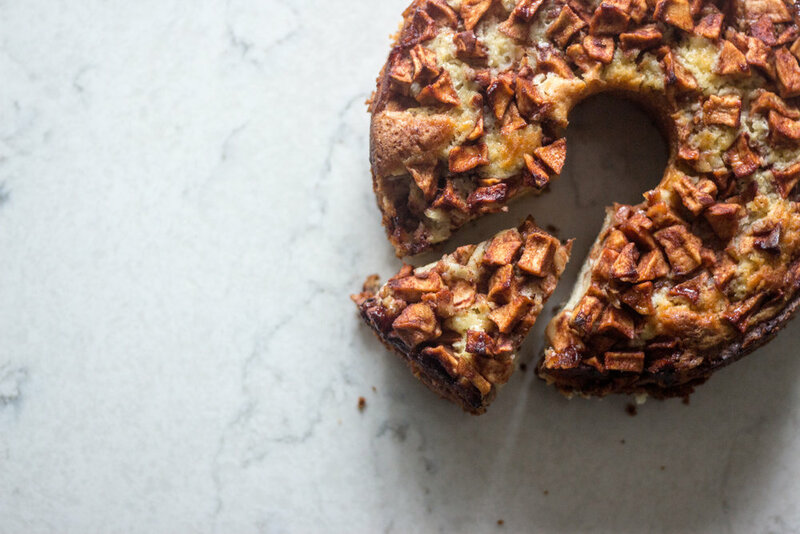 Let's talk about this apple cake. 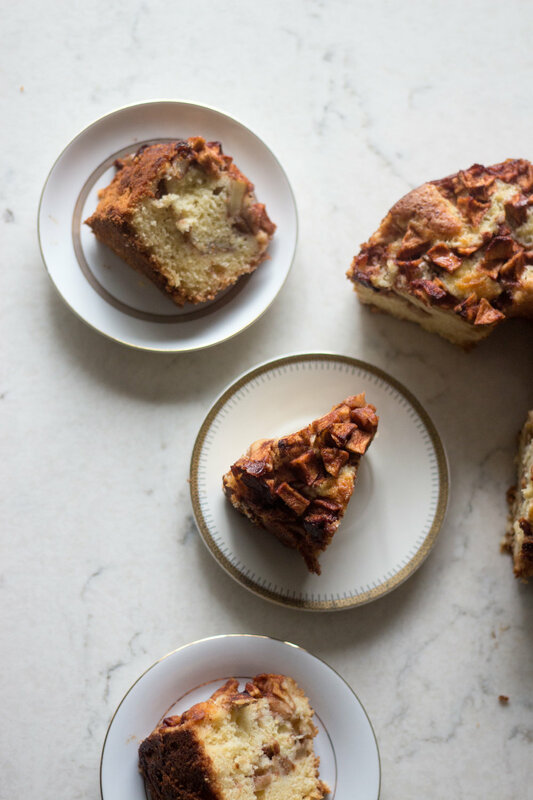 It's a moist and soft coffee cake studded with cinnamon-y apple chunks that seem to taste even better on the days after it's made. 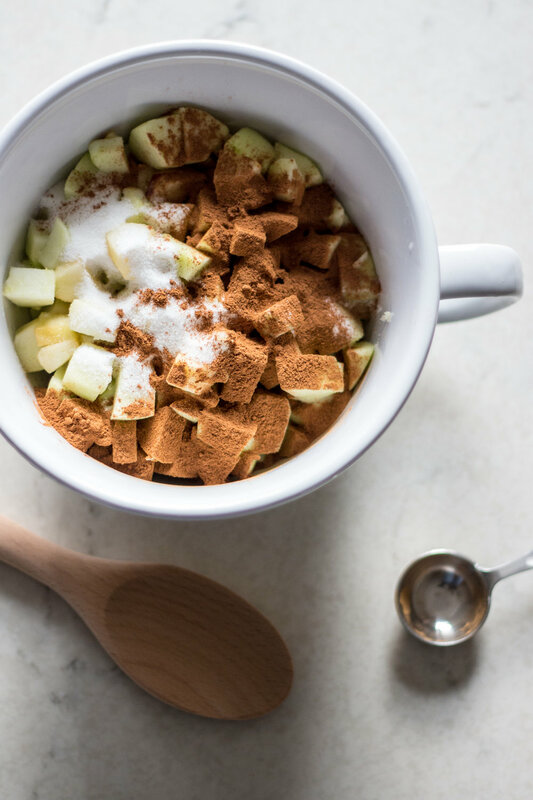 The apples are chopped into chunks, tossed in sugar, cinnamon, and a dash of nutmeg, and you can even see the juices from the apple start to run as you make the batter. The cake is rich even without butter, baked into a 10-inch tube pan with batter, apples, batter, and more apples. 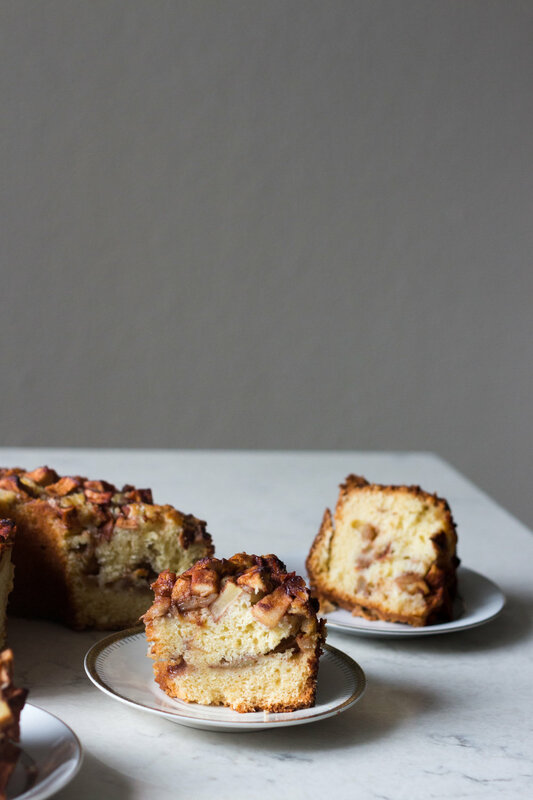 indulge after 90 minutes at 350, and patience will reward you with a moist apple cake. 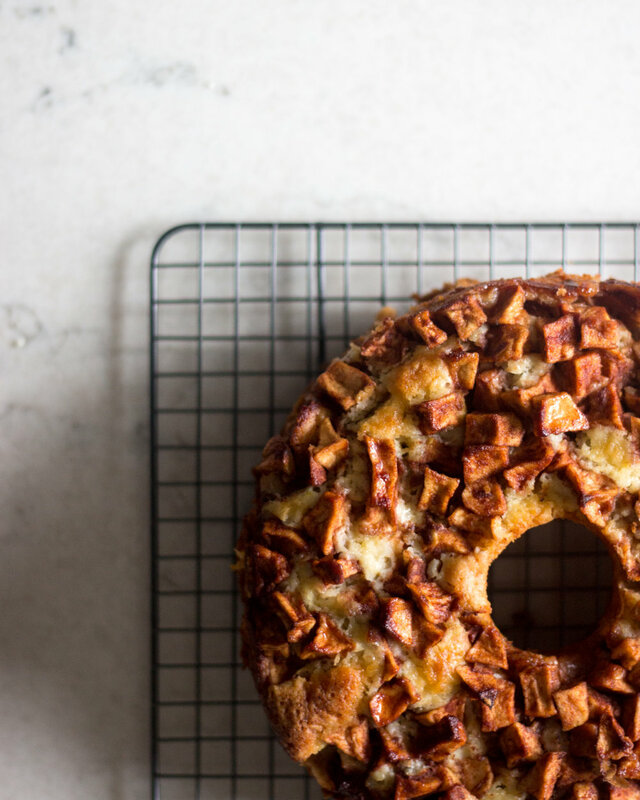 Even more patience, and you'll get an even better apple cake the next day. baker's tips: Ideally this would work best in a 10-inch tube pan, but I think a 10-inch bundt pan or another tube pan equivalent would work as well. use any firm apples you have on hand. I used a combination granny smith apples and honeycrisp. also, a cup of chopped walnuts would work too but i don't care for them. preheat oven to 350 f. grease a 10-inch tube pan, and grease it well, because i didn't and had a really hard time getting the cake out. for the apples: peel, core, and chop apples into 1-inch chunks. pour the apples into a large bowl, and stir in the cinnamon, 5 tablespoons sugar, and pinch of nutmeg, if using. for the batter: in a large bowl, stir together flour, baking powder, and salt. in a medium bowl, whisk together oil, orange juice, sugar, vanilla, and eggs. Pour the wet mixture into the dry mixture. Stir well until all ingredients are incorporated. pour half the batter into the greased pan. spread half of the apples, along with their juices, over the batter. cover the apples with the rest of the batter, and top the remaining apples on top. bake the cake for about 1 1/2 hours, or until a tester inserted in the center comes out clean. make sure your tester goes all the way to the bottom and is tested below the top layer of apples to make sure there aren't any hidden pockets of uncooked batter. if your cake is browning before it's done, top it with a piece of foil. cool completely before releasing the cake from the pan. enjoy!! !